Object-oriented programming (OOP) is a method for organizing programs that brings together many of the ideas introduced in this chapter. Like abstract data types, objects create an abstraction barrier between the use and implementation of data. Like dispatch dictionaries in message passing, objects respond to behavioral requests. Like mutable data structures, objects have local state that is not directly accessible from the global environment. The Python object system provides new syntax to ease the task of implementing all of these useful techniques for organizing programs. But the object system offers more than just convenience; it enables a new metaphor for designing programs in which several independent agents interact within the computer. Each object bundles together local state and behavior in a way that hides the complexity of both behind a data abstraction. Our example of a constraint program began to develop this metaphor by passing messages between constraints and connectors. The Python object system extends this metaphor with new ways to express how different parts of a program relate to and communicate with each other. Not only do objects pass messages, they also share behavior among other objects of the same type and inherit characteristics from related types. The paradigm of object-oriented programming has its own vocabulary that reinforces the object metaphor. We have seen that an object is a data value that has methods and attributes, accessible via dot notation. Every object also has a type, called a class. New classes can be defined in Python, just as new functions can be defined. 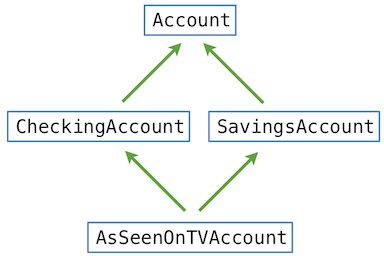 An Account class allows us to create multiple instances of bank accounts. The act of creating a new object instance is known as instantiating the class. The syntax in Python for instantiating a class is identical to the syntax of calling a function. In this case, we call Account with the argument &apos;Jim&apos;, the account holder&apos;s name. When a class statement is executed, a new class is created and bound to &lt;name&gt; in the first frame of the current environment. The suite is then executed. Any names bound within the &lt;suite&gt; of a class statement, through def or assignment statements, create or modify attributes of the class. The &lt;suite&gt; of a class statement contains def statements that define new methods for objects of that class. The method that initializes objects has a special name in Python, __init__ (two underscores on each side of "init"), and is called the constructor for the class. This "call" to the Account class creates a new object that is an instance of Account, then calls the constructor function __init__ with two arguments: the newly created object and the string &apos;Jim&apos;. By convention, we use the parameter name self for the first argument of a constructor, because it is bound to the object being instantiated. This convention is adopted in virtually all Python code. Now, we can access the object&apos;s balance and holder using dot notation. Each method definition again includes a special first parameter self, which is bound to the object on which the method is invoked. For example, let us say that deposit is invoked on a particular Account object and passed a single argument value: the amount deposited. The object itself is bound to self, while the argument is bound to amount. All invoked methods have access to the object via the self parameter, and so they can all access and manipulate the object&apos;s state. The &lt;expression&gt; can be any valid Python expression, but the &lt;name&gt; must be a simple name (not an expression that evaluates to a name). A dot expression evaluates to the value of the attribute with the given &lt;name&gt;, for the object that is the value of the &lt;expression&gt;. Method and functions. When a method is invoked on an object, that object is implicitly passed as the first argument to the method. That is, the object that is the value of the &lt;expression&gt; to the left of the dot is passed automatically as the first argument to the method named on the right side of the dot expression. As a result, the object is bound to the parameter self. To achieve automatic self binding, Python distinguishes between functions, which we have been creating since the beginning of the course, and bound methods, which couple together a function and the object on which that method will be invoked. A bound method value is already associated with its first argument, the instance on which it was invoked, which will be named self when the method is called. In some cases, there are instance variables and methods that are related to the maintenance and consistency of an object that we don&apos;t want users of the object to see or use. They are not part of the abstraction defined by a class, but instead part of the implementation. Python&apos;s convention dictates that if an attribute name starts with an underscore, it should only be accessed within methods of the class itself, rather than by users of the class. Evaluate the &lt;expression&gt; to the left of the dot, which yields the object of the dot expression. &lt;name&gt; is matched against the instance attributes of that object; if an attribute with that name exists, its value is returned. If &lt;name&gt; does not appear among instance attributes, then &lt;name&gt; is looked up in the class, which yields a class attribute value. The expression checking.deposit evaluates to a bound method for making deposits, which was defined in the Account class. When Python resolves a name in a dot expression that is not an attribute of the instance, it looks up the name in the class. In fact, the act of "looking up" a name in a class tries to find that name in every base class in the inheritance chain for the original object&apos;s class. We can define this procedure recursively. To look up a name in a class. Then, a clever executive conceives of an AsSeenOnTVAccount account with the best features of both CheckingAccount and SavingsAccount: withdrawal fees, deposit fees, and a low interest rate. It&apos;s both a checking and a savings account in one! "If we build it," the executive reasons, "someone will sign up and pay all those fees. We&apos;ll even give them a dollar." The precise algorithm for finding method resolution orderings is not a topic for this course, but is described by Python&apos;s primary author with a reference to the original paper. In particular, we would like our object system to promote a separation of concerns among the different aspects of the program. Each object in a program encapsulates and manages some part of the program&apos;s state, and each class statement defines the functions that implement some part of the program&apos;s overall logic. Abstraction barriers enforce the boundaries between different aspects of a large program.